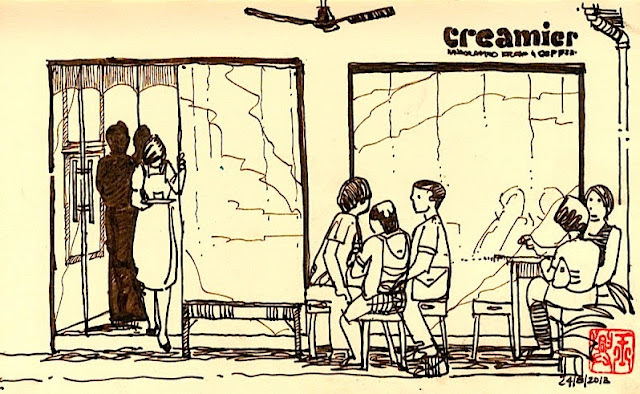 Creamier, I was told, is an ice cream shoppe opened by designers. But that does not matter. When it comes to food, the proof is still in the pudding. In this case, it’s in the ice cream. When I got here, I was told that the waffle is a ‘must try’. So that’s what I did. I asked for the waffle topped with a ball of Horlicks and chocolate chip ice cream. After a 15-minute wait, the sweet treat arrived. The waffle was nicely sweet and delightfully crispy outside. I was suspicious of the ice cream though – it tasted more like something with banana. They probably got mine mixed up with someone else’s – my dessert arrived before someone who ordered before me. Ultimately, the texture of the waffle was okay and the taste of the ice cream was nice, but I still prefer Gelare when it comes to waffle ice cream dessert.